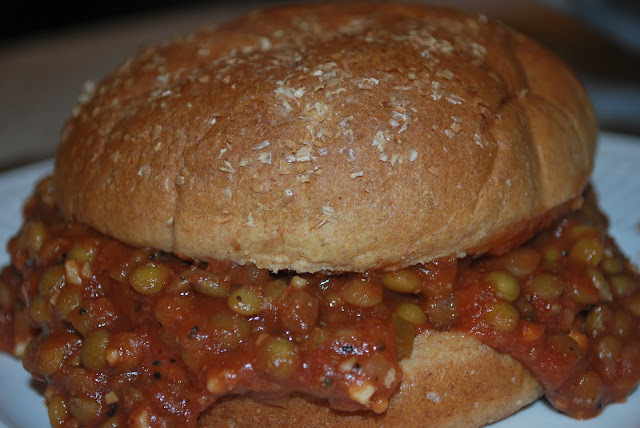 These are definitely a healthier version of the traditional Sloppy Joes...and they are still yummy too! They are pretty quick and easy, especially if you already have your lentils cooked up and ready to go! Directions: Bring 2 cups water to a boil, add the Lentils, return to a boil, reduce heat, cover and simmer for 25-35 minutes (depending on the age of the lentils). Once the lentils are cooked, add the tomatoe paste and 1 1/4 c water. Stir in the onion, green pepper, salt, sugar, mustard, chili powder and flakes, cornstarch, and garlic. Combine over heat to heat throughout. Serve on whole wheat buns. Recipe adapted from original found on vegweb.com, submitted by "AMcPher"